Meyers Falls Market hosted a class in their community room where I worked hands-on with a group in making their first Mozzarella cheese! A successful class, everyone went home full with extra cheese to share with their family and recipes to try it again! Meyers Falls Market has ALL the ingredients necessary for making Mozzarella: organic rennet, citric acid, salt, raw milk! or “comment” onto this web page to contact us about joining a class. Classes are available to be scheduled as suits your schedule & mine. Individual or group classes can be arranged at my house or yours! Introductory course will be on how to make MOZZARELLA (and the by-product, Ricotta). You will head home with recipes and notes and a package of your own fresh mozzarella! This is an informal class, our goal is to teach people basic cheesemaking skills so that you can learn a useful trade and have a fun, healthy product to take home. Advanced course will be on how to make AGED CHEESE. You will head home with recipes and notes and information on how to complete the process of aging cheese. Preferable if you have a cheese press – if not, the class can provide one for on-site demonstration use. 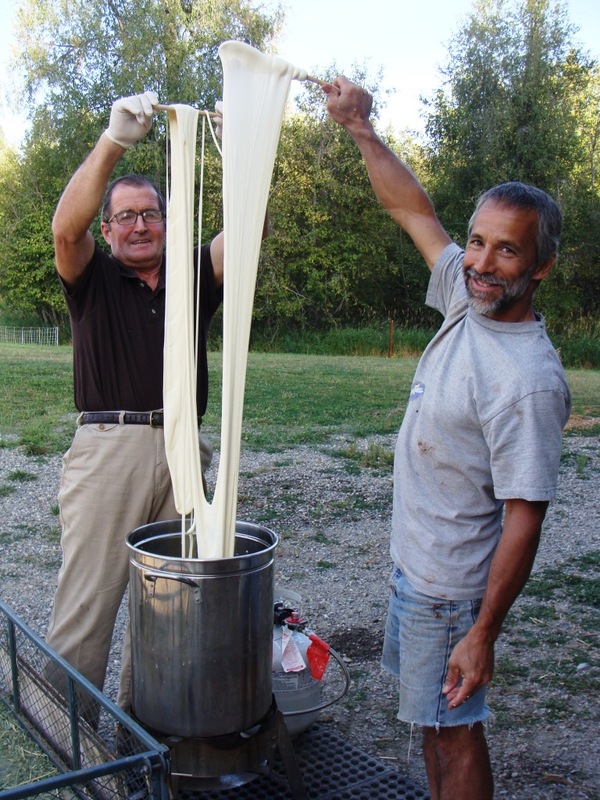 My family men making a large batch (10 gallons, which turns into 10+ pounds) of Mozzarella for home use! Everyone LOVES the part where we get to stretch the cheese! I would be interested in a group class. I am confused thou as to where you are located. Web page says…… Please note location: Classes take place in NE Washington State, but a number of the responses on this page imply you are in Maryland. I just now noticed this blog’s latest entry is 4/24/2013. Is this still active? That is great, Welcome to Washington. Do you have a calendar of proposed classes or wait for interest to schedule. And, where in NE Washington are you located. I am interested in a cheesemaking class. Curious when you will have another class? Thank you! Hi, I live on Kent Island and my wife and I would love to take a class. Do you publish a schedule or hold them when your time allows? Thanks. I will be sending out an email soon with dates. I’m just finishing up some college classes, but in April plan to have a couple classes. Thanks! I would like to attend the next class. Please let me know when. I would love to attend a cheese making class. Are you going to do any in the near future? I have 2 people who would like to take a cheese making class with you all. When do you have something coming up? We are about 1 hour north of Harrisburg Pa. Not far. I would like to attend a cheese-making course this winter with a friend. Will there be upcoming courses we could sign up for? Thanks in advance. I am waiting until my cow calves so there will be milk available. She’s taking longer than I thought to calve, as she was bull bred and her earliest possible calving date was Dec 10. I promise to post a date as soon as she calves! I would like to attend your cheese making class in January. Where on the Eastern Shore are you located. Any fall classes and where in eastern md?? January will be the next class. I emailed you some information, thanks! Is the class already over?? I would also be interested. Have you set any dates yet for this spring? We have a first class, but I think it is full. If not, I will post the date and time for others to join. I’ll be sure to post the next open cheesemaking class. 🙂 Thanks! We would love to take a class! We currently have dairy goats and are interested in cheese making. It would be my husband and I. Please let me know when you are doing classes! Thanks! Would love to attend a class! I have some friends I know will be interest, too. Eastern Shore of Maryland. Right now, I am available most days for classes. This is a slow month at work, because the herd is seasonal. Because I do this at home, the classes are pretty small. If you are located nearby, we can come up with a time to do a class – Just email me. I have two other people interested and their schedules are also flexible. I live on the Eastern shore and would love to take a cheese making class. I know this was posted like years ago, but I can’t find anything else that isn’t half way across the country. They sometimes have cheese classes!